War changed the face of New Zealand in the 19th century. Tens of thousands of Māori died in the intertribal Musket Wars of the 1810s, 1820s and 1830s. Muskets revolutionised intertribal warfare, decimating the population of some tribes and drastically shifting the boundaries of areas that some tribes controlled. Thousands more fled their traditional lands, freeing large areas for Pākehā (European) settlement and complicating questions of ownership. From the 1840s to the 1870s British and colonial forces fought to open up the rest of the North Island for settlement. At the heart of this lay a volatile combination: contested issues of sovereignty following the signing of the Treaty of Waitangi in 1840, decreasing willingness to sell land to the government, and increasing pressure for land for settlement as the European population grew rapidly. Many Māori died defending their land; others allied themselves with the colonists for various reasons, often to settle old scores. 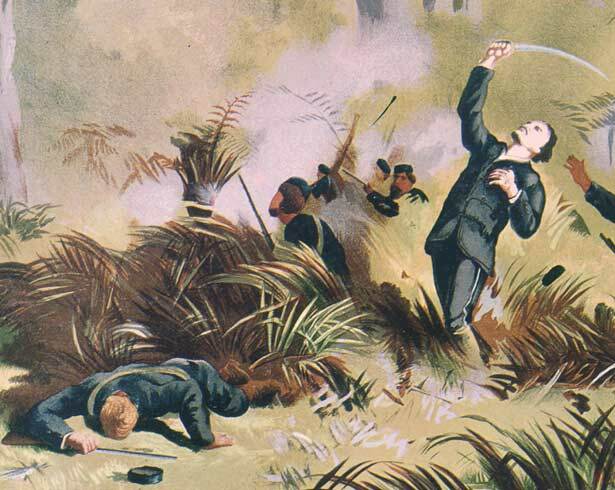 In all, there were an estimated 3000 casualties during the New Zealand Wars – the majority of them Māori. But for some Māori the wars were only the beginning, with land confiscation being the fate of many of the survivors. After the wars the struggle for land entered a new and, in some respects, more damaging phase, giving rise to a whole new chapter in New Zealand's history. We have 20 biographies, 12 articles, related to New Zealand's 19th-century wars.